Tracy is ten years old. She lives in a children's home, but would like a real home one day, with a real family. I loved this book when I was younger. Having no experience whatsoever of foster care, orphanhood, or anything other than the two-parent family, I was fascinated by Tracy's story. 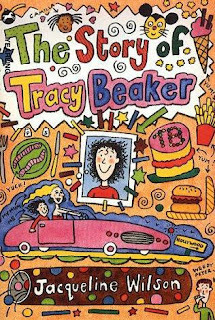 Fifteen years on, I still have a lot of respect for Jacqueline Wilson, and found myself swept along with Tracy's fast-paced, but problematic life. 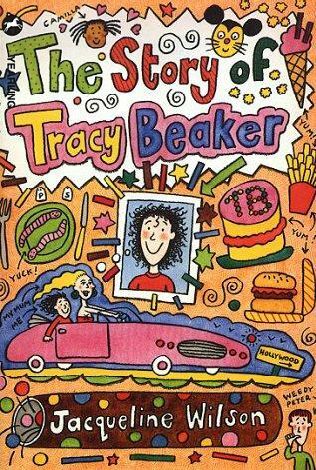 The story is written in first-person, as though Tracy is writing her own autobiography. She is a brilliant character, so funny and imaginative. Best of all, Tracy is a feisty little madam. As a kid, I just thought she was brilliant, and able to look after herself. Now, I can see Tracy has developed a thick skin during her time in care, and her bossiness, forwardness, and hot-bloodedness are all survival tactics for the difficult environment in which she exists. Tracy is such a believable child narrator. She isn't overly naive, yet she is in no way mature. I possibly found her funnier now than I did when I was younger; things like calling her social worker 'Elaine the Pain' just totally appealed to my stupid sense of humour. I found I was picking up on more details when reading this as an adult. Tracy describes her mum as a beautiful, rich, classy woman, who will come and pick her up in her Cadillac as soon as she's finished shooting a film in Hollywood, or returns from sunny Spain. She's too busy to call, and too far away to visit. Reading now, it's clear that these are all just white lies of Tracy's created to help her cope with her mum's absence, but children won't necessarily pick up on this; I don't think I did when I was ten. It made the novel that wee bit more sad for me, and more realistic. Nick Sharratt's illustrations are dotted throughout the novel, and they do nothing but add to the story. I particularly like the illustrations of Tracy's letters to Cam, and the way Sharratt draws us in using his drawings. It was so exciting. I remember loving his skills when I was younger, and I still do; he makes Wilson's novels even more fun, and he makes a Wilson novel easily recognisable from any other. Overall, I think this is an important novel for children to read. It's short and snappy for adults, but really is worthwhile to spend an afternoon with. You'll laugh, you'll be touched, and you'll finish off with a warm feeling.